Primary Beginnings Child Development Centers works hard to provide the quality child care and preschool programs you expect from a 5-star child care center. In order to help serve more families, we proudly have two convenient preschool locations in Raleigh, NC. Each of our child care centers has their own unique features, while still teaching the same curriculum and maintaining a 5-star license. 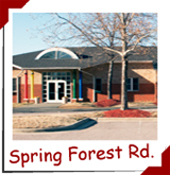 Our Spring Forest Road location is great for those who live or work in North Raleigh. It offers easy access to I-540, Atlantic Ave, Capital Blvd, and more. Our North Hills location is perfect for families who live or work inside the beltline in or near the North Hills area. This location is convenient to I-440, Glenwood Ave, Blue Ridge Rd, and more. Please check out both of our Raleigh preschools and see which location is right for you. *Please Note* Our Falls of Neuse location has closed. 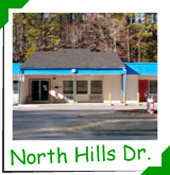 Our Raleigh preschool locations are : Spring Forest Road and North Hills Drive. Tour our 5-star child care centers by contacting your preferred location or by filling out our convenient contact form. "My son loves to come to school every day. He says that he has learned so much he is ready to go to Kindergarten!" "My son has been attending Primary Beginnings for about 2 years. I can truly say that Micah loves all the staff members and teachers. It was a big transition for Micah to start a new daycare but the teachers made him feel comfortable. The loved on him so much that there were days he didn't want to leave. The staff and teachers have also been very attentive to Micah's food allergies and other health issues. They have always kept me informed on anything that has come up with his overall health. The teachers and staff are always smiling and loving on the kids there. As a single parent, this daycare was the best decision I could have made for my son Micah. He loves it here!"